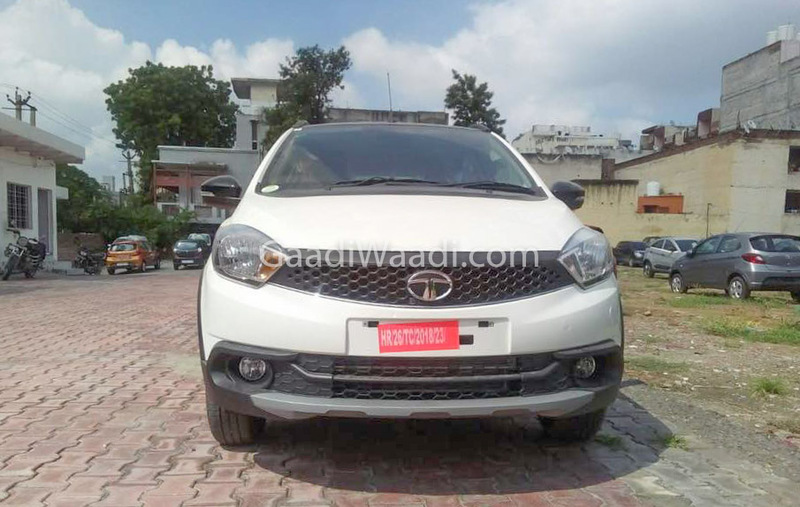 Having launched in April 2016, the Tiago became the best-selling vehicle for Tata Motors in no time and is the first major success with Impact design philosophy that harbingered a new brand perception. Tata has retailed more than 1.65 lakh units of the Tiago in the domestic market and most of them are being top-end variants. Riding on a wave of momentum, Tata Motors is wary of expanding the Tiago’s reach and has introduced a rugged crossover variant called NRG. Rumours of the NRG’s existence has been around for long and it finally enters the market today at a starting price of Rs. 5.50 lakh for petrol and Rs. 6.32 lakh for diesel (ex-showroom, New Delhi). There have been plenty of changes involved compared to the standard Tiago hatchback in the NRG and it has a distinctive character altogether. The Tata Tiago NRG has additional ground clearance of 10 mm (at 180 mm) and it will complement the volume sales of the regular model that consistently finds itself in the top ten best-selling chart every month. The Tiago NRG arrives right on the back of Hyundai i20 Active, Maruti Suzuki Celerio X and the recently launched Ford Figo-based Freestyle crossover’s good reception among customers. With ‘Energy To Do More’ tagline, the Tata Tiago NRG has a slew of cosmetic enhancements for infusing a crossover attire. Said to be “armoured design all around”, it gets faux skid plate up front and rear, black body cladding around the lower portion, black treated front grille replacing the chrome applique, black plastic cladding on the B- and C-pillars, wing mirrors and Infinity roof finished in black, wheel arches in Squircle shape, and new tailgate design as seen in the Kite concept. All the exterior changes foster a dual-tone theme to the Tiago NRG and the sporty demeanor is reassured by bi-tone four-spoke DurAlloy wheels, roof-integrated rear spoiler and blackened roof rails. Despite having same underpinnings as the regular hatchback, the NRG is 47 mm longer and 50 mm taller with overall length of 3,793 mm and 1,587 mm respectively. 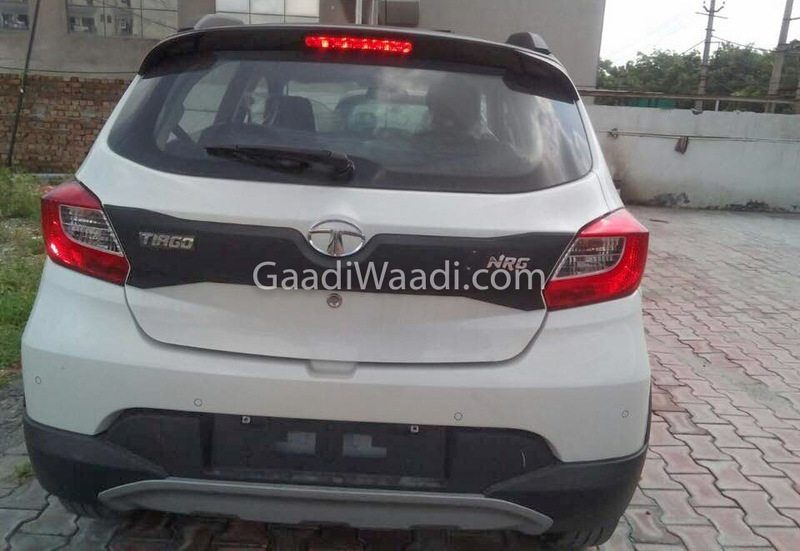 Tata did not just stick with enhancing the exterior as interior has gained noticeable updates on the Tiago NRG. It comes equipped with an all-black cabin and gains subtle Canyon Orange highlights and unique fabric inspired by Denim with contrast orange stitching. With the Tiago being an already feature-rich model, features such as five-inch touchscreen infotainment system with 3D navigation, eight-speaker Harman audio, cooled glovebox, six-way adjustable driver seat and dashboard with premium silver trims are also present. The engine options continue to be the same as 1.2-litre Revotron petrol and 1.05-litre Revotorq diesel are used. The former produces a maximum power output of 84 bhp and 115 Nm, while the latter develops 69 bhp and 140 Nm. Both the engines are mated to a five-speed manual transmission only in the Tiago NRG. 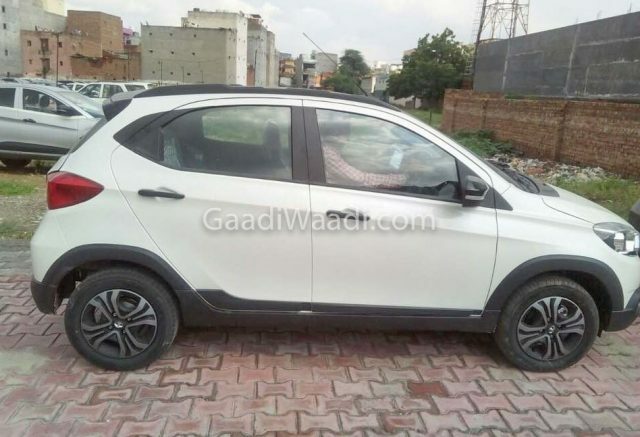 Compared to main rival Maruti Suzuki Celerio X, priced between Rs. 4.75 lakh and Rs. 5.61 lakh, the Tiago NRG is at a premium but with more features, making for another attractive proposition from Tata. The slew of safety features offered as standard are dual airbags, ABS with EBD, corner stability control, reverse parking assist, follow me headlamps, driver seatbelt reminder and smart rear wiper. The three colour options to choose from are Malabar Silver, Canyon Orange and Fuji White.